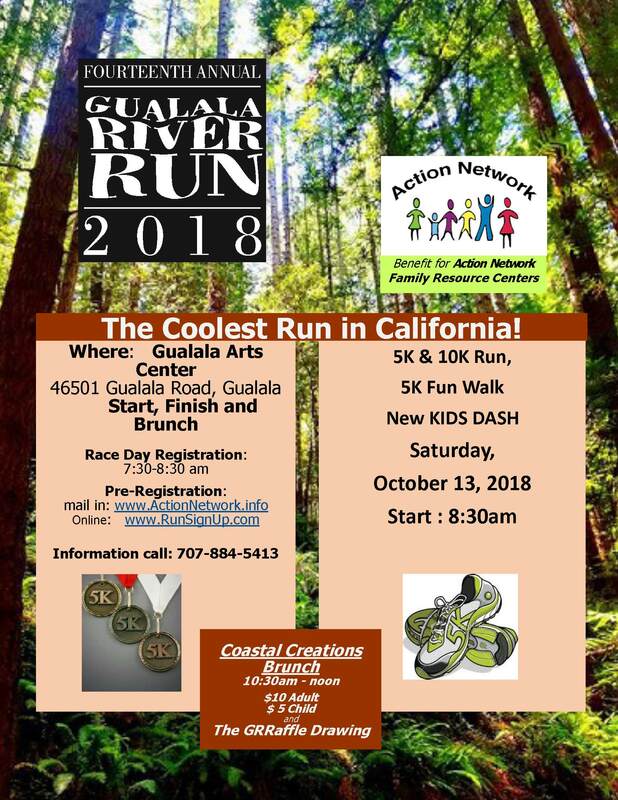 Action Network Family Resource Center’s 14th Annual Gualala River 10K & 5K Runs, 5K Fun Walk and Kids Dash (500 meters) –Proceeds Support our Youth Programs. Place, Gualala Arts Center, 45601 Gualala Road, Gualala, CA, 95445, start/finish. Courses. The runs and walk follow paved and gravel roads along the Gualala River through majestic redwood forests. Brunch: 10:30, Coastal Creations celebrated brunch starts. Build-a-Burrito Buffet. Adults are $10, Youth 10 and under, $5. GRReat Raffle Drawings for deluxe lodging, dining and shopping packages. Tickets are $5 each or 6 for $20. Purchase online or local business. Need not be present to win. Awards: 10:30 am. Trophy to first man and woman in 5K &10K, medals three deep in 10 age categories. . Timing and Results: Synergy Race Timing – chip timing. Registration: Go to www.RunSignup.com/Gualala river run or for a printable form, http://www.actionnetwork.info or call 707-884-5413. Online registration is available through October 10. Race day registration is 7:30 to 8:30. Fees: Adults as are $35 for the 10K & 5K Runs and Virtual Run. The Fun Walk is $30 per person. Youth 18 and under are $10 for any event. Team Discount for teams/groups of 5 people or more is 20%. Questions: Action Network, 707-884-5413 or J. Platt, 925-708-0508.